When we came to know about Who Are You Stranger? by Shweta Grewal, we were not sure about what to expect from the book. But, the title sounded like a mystery is something we can expect from the book. By the way, what do you think about the book content by this title? Please share your assumptions via comments below (of course before completely reading this article 🙂 ). On one thought, the book could have been moving the story ahead in the spiritual zone also! Well, let us explore it to know the answers rather than keep guessing, right? 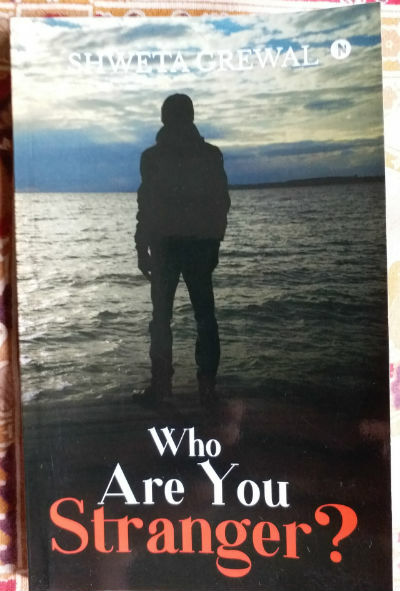 Book Title : Who Are You Stranger? The cover page shows a person which you cannot recognize standing in the backdrop of a sea. The cover page thus tries to be faithful to the book title. The colors on the top segment are getting little mixed. The author name is not very clearly visible. Possibly some design changes could have made it better. Overall a simple and not very attractive cover. The book starts with a fantastic prologue. A young girl whose father serves in armed forces is trained to cop-up with challenging times. The toughness and the lessons to live a life by enjoying it against all odds is implanted in such kids effectively. This segment will hook you to the book without a doubt. When the story starts, the kid is now a grown-up young and pretty girl. She is self-dependent and has her own job. One fine (or shall we say un-fine?!) day, she has to detach herself from the job. Now, she is all alone and has a lot of time to kill. The pessimistic thoughts started taking over her. And thus, she has decided to have a trip to a beautiful place. It is a wise decision. Depression actually kills in more brutal and silent way than we can imagine. When in a foreign country she accidentally bumped into (or rather we say met) a young and handsome boy. They had a few meeting in flimsy style and eventually, they got along quite well. Who is this stranger? What does he do to live? Was he met the female protagonist accidentally? or was it part of some plan? The story moves ahead with a few twists and turns and eventually reaches a climax which is better not be revealed :). The book starts fantastically. As mentioned earlier, the prologue of the book is really gripping. And, it is the best part of the book, as far as my view is concerned. The girl who was growing to be tough and self-dependent didn’t found the same throughout the rest of the story. You can’t count on anyone but yourself in the world my tiger. Always remember this. People never fail to baffle me. You think you know them and then they do something very unexpected. I don’t claim to be a saint, but then neither am I the devil, always trying to find weaknesses in people, and then use it as a weapon against them when it suits me. That guy desperately wants to be with me, and this guy avoids me like I’ll turn him into stone by looking at him. It also reflects that the strong girl is having the-girl-next-door like feelings. I like the following line about admiring nature and beauty which we often miss, especially these days when (so-called) “Smart” phones started taking over the most of our attention. Anyone can see that beauty in small things. You just need to pay attention. You need to stop and look at them to appreciate them. The book works in bits and pieces. There comes dull phase and then comes a thrilling situation. And it keeps repeating. The author tries creating a suspense, and at places, she does it effectively. The mysterious person who tries attacking the female protagonist and other stuff are so mixed up that you feel that the finale should clear all the dust. Though the conclusion is not bad, I didn’t find it very convincing also. For me, the tempo of the book loses its direction somewhere when the “thriller” genre is trying to be merged with the “romantic” one. The book could have been much better. For me, the book is value for money as I have received it to provide unbiased reviews, but if it could have been more conclusive and thrilling, especially towards the end, it could have been a better reading experience. The book doesn’t talk about the wrong idea about feminism and there are no lectures on it. Rather, some of the actions of the female protagonist (and her growing up as a kid) talk a lot about gender neutrality. It is a good sign. The book is comparatively smaller one, so you can enjoy it as your travel companion during a journey. And yes, the author is coming with her next book in the near future. At least, we get a hint about that from the book itself 🙂 . The author has a potential and with more efforts in the right direction, she can amaze the readers with her thriller in future. A book which starts fantastically and raises your expectations form the same, not remain so true to its genre throughout. The climax could have been more gripping. Not more than 7 out of 10.